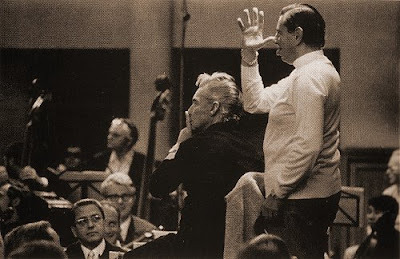 I don't know what was going on in the studio, but that is producer Michel Glotz apparently doing what other people have only dreamed of doing behind Herbert von Karajan's back. Today the sad news comes of the death of the French recording producer aged 79. Glotz is best known for his work with Karajan and he won several Grammys including one for producing HvK's 1978 Beethoven symphony cycle for Deutsche Grammophon. He was part of the non-negotiable 'Karajan package' that came with the conductor's recordings, irrespective of the label they were to be issued on. Unfortunately for that reason he was not a popular figure with EMI's staff producers who had to step aside for Glotz on classic Karajan recordings such as Pelléas et Méliande. Wasn’t there a story-apocryphal I bet, but still funny-that at one Salzburg Festival in the 60’s, Hans Knappertsbusch noticed a sign on a bathroom door that said “for Herbert von Karajan only”. He immediately put on up on another one that said “for all the other assholes”.